The Software that Reminds You to Stretch! Lloyd Kahn's new book about house trucks, campers, road rigs, handmade trailers, houseboats, sailboats, and small mobile living. 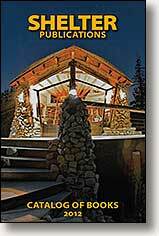 Lloyd Kahn's best-selling book about small houses, campers, road rigs, houseboats, cob, straw bale, round timber, and much more. Learn more "A glorious portfolio"
A stunning sequel to Shelter, Home Work illustrates even more imaginative ways to put a roof over one’s head, some of which were inspired by Shelter itself. Techniques and materials using adobe, rammed earth, bamboo, ferro-cement, and cob to build simple homes. Our classic namesake book from 1973, with over 1000 photos of amazing handbuilt shelters: huts, tents, domes, yurts, caves, barns, houseboats, treehouses, sheds, and much, very much more. From 1978, the long-lost sequel to Shelter has been republished. How to build a yurt, using natural, low-cost materials. Clear step-by-step illustrations. 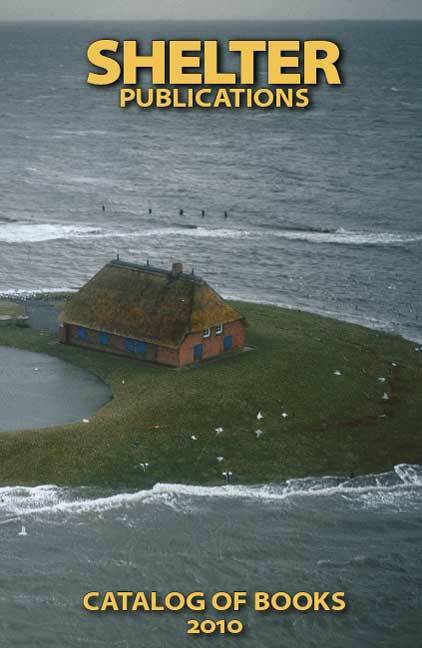 Many yurt resources for materials, supplies, ready-made yurts. Photos of homes in Mongolia, China, Indonesia, India, Romania, Tunisia, Spain, Togo, Senegal, and Bolivia, along with colorfully colored illustrations of each home, make this a wonderful book for children. How they work, how to maintain them, what to do if things go wrong. Simple, clear, informative. Plus great drawings by VW Idiot Book artist Peter Aschwanden. A country kitchen wherever you live! Learn country cooking fundamentals so that when you get through reading it you won't need cookbooks any more. A fascinating 1903 catalog of greenhouses, cottages, bungalows, chicken coops, potting sheds, garden furniture, gazebos, and tools. Written in 1914 by the founder of the Boy Scouts, this unique book shows how to build both simple and complex sheds and shacks. Contains hundreds of wonderful pen-and-ink drawings and illustrations by the author. Written in 1945, this masterpiece of outdoor living contains 500 richly illustrated pages of woodcraft lore rarely seen today. Author and illustrator Arthur Okamura fashions paper frogs that actually jump, uses a mirror to draw a magical star, and shows how to unpeel a sliced banana. Plus 35 other amazing tricks! Ideal for kids, car rides, and picnics, this book makes anyone an instant magician. A unique workbook, a single place where you can document the many things that must be taken care of by your survivors after your death. A thoughtful, wonderful legacy for your loved ones. Join Lloyd on an ocean kayak trip from his home thru the Golden Gate and into San Francisco. Stretching has been resized to a more convenient pocket-sized format. Same huge content, new smaller size. Stretching has been revised once again, with 10 new stretching routines for computer users, office ergonomic information, and a new 2-color design throughout. Help for the office worker. Twenty stretching routines to help prevent neck and shoulder stiffness, lower back pain, stiff muscles and joints. How to stay fit even though you sit at a computer or desk each day. Try them now. You'll feel better! A unique workout book for anyone who wants to get back into shape. Written by bodybuilding legend Bill Pearl, international stretching authority Bob Anderson, Olympic runner Jeff Galloway, and exercise physiologist Edmund Burke. Use tennis for a cardio workout. A new method that uses running, lunging, leaping, and stretching for a great game and a great workout! eBook versions of Jeff Galloway's book Marathon: You Can Do It! have been released into the Apple iBookstore (for iPad/iPhone/iPod Touch) and on Amazon.com for the Kindle. Updated in-depth information, planning, and training for anyone who wants to run a marathon, by Olympic runner Jeff Galloway. Olympic runner Jeff Galloway's definitive guide to running, completely revised and updated. With state-of-the-art training and techniques for both novices and competitive runners. Our book on the internal martial arts from ancient China  Taoist exercises, including: Chi Gung, Taoist Yoga, Yijinjing, and self-massage. Beautifully illustrated. 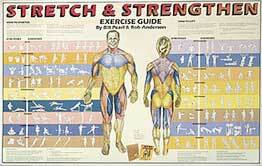 Large laminated poster shows stretches and exercises for each muscle group. StretchWare software reminds you to stretch while working at your computer. Developed from the stretching exercises of Bob Anderson, author of our best-selling book Stretching. Shelter Publications, Inc. All rights reserved.